Spacious, oceanfront home at water's edge. Unspoiled panoramic views of the ocean and coastline from an expanse of windows. Mesmerizing views of the ocean from every room. Five/six bedrooms plus additional sleeping on futons & and roll-away beds. Relaxing on the 45 ft deck with the surf below is breathtaking. The side deck is ideal for early morning breakfast or evening dining. Spacious oversize great room is conducive to family reunions,seminars,group meetings,graduations,etc. (seating for 16 no problem) The living room boasts a massive fireplace with walls of windows for ocean & coastal viewing .The solo panorama sun room is exquisite so enjoy the 270 degree view of the coastline from Cape Cod to Cape Anne. The home is situated on 1.5 acres of private and secluded property in the highly desirable 40 Steps Area. Nahant prides itself as being one of the safest towns in the state and enjoys the security of one carefully monitored road to and from this peninsular community. It has been described in the Boston Globe as the 'gated coastal town' of Boston where families can enjoy a vacation along with the relaxation and comforts of home... and without worries. Nahant is a town known for recreational activites as far as your imagination can dream. This quaint town is a true leisure experience at its best.... and don't worry about traffic jams, they start just after the turn off to Nahant. The home is seconds from a challenging golf course, tennis courts, private beaches, and a quaint boating harbor. Many walking/jogging paths along a 3-mi beach, as well as many paths throughout the town to enjoy the serenity and natural beauty of Nahant . Fishing, scuba diving,sailing,skiing,,rock climbing, bird-watching, skating, blading, wind surfing, jogging/walking/biking ,photography,among others...is commonplace in Nahant. Bus/taxi service is also available. Nahant has all the trimmings of a recreational playground which provides activities for children as well as for adults. Nahant has been the Boston playground for decades and is protected from the noise and pollution of the big city with one thing in mind... relaxation! There are many diverse and exceptional restaurants in and around Nahant; shopping malls in every direction; close proximity to all major attractions : Boston, Salem, Marblehead, Gloucester, etc. deep sea fishing and whale-watching tours in the immediate area with daily trips. Nahant offers an island atmosphere with the best beaches in the Boston area (all 10 of them) within 20 min. to Boston & 15 min.to Logan Arpt., 5 min. to commuter rail for travel to Boston (18 min.) or head north to Maine and New Hampshire. Challenge your shots on the most picturesque course in the area. A great variety of greens which will challenge the best and beginners can still have fun. A cozy restaurant /bar makes for fun finale! A first class 9 hole course directly on the ocean with excellent restaurant/bar on the premises. Carts and rental clubs available at pro shop. The ocean is at your door step. Look down from the 8 x 50 ft. deck and you are looking at the ocean.The morning sunrise over the famous Egg Rock wakes you with ocean views photographers beg for. 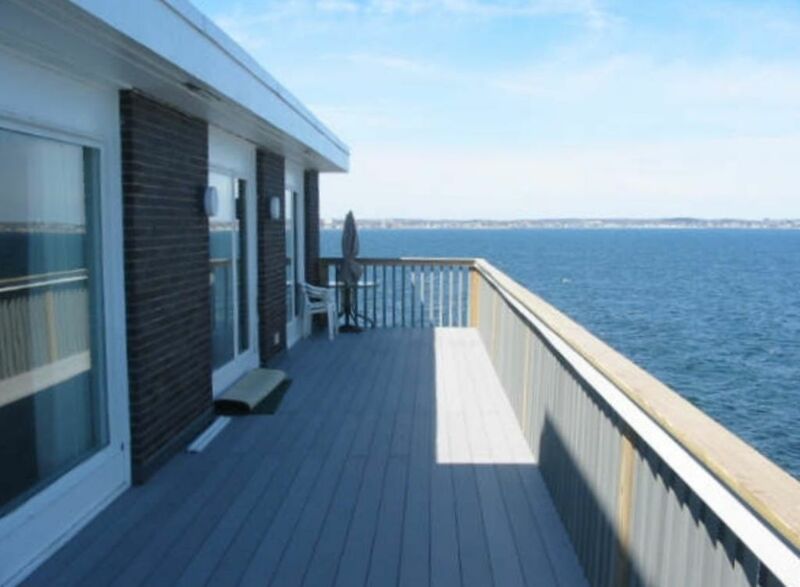 Unparalleled unobstructed direct oceanfront view with working lobster boats only meters away from the deck. Fishing from your front yard off the rocks is the choice for many of our guests-fresh Bass! Best area of the home for real life viewing of the ocean activities such as lobster-men working the traps and boaters racing to the beaches. Amazing and magnificent view of the crashing waves from this home. Don’t know that we’ve ever seen the like. The owners are delightful and Nahant is a gem of a community. The highlight of our stay may have been romping on the causeway beach with our dog. Thank you Linda and Joe for being dog-friendly hosts. That’s our number one criterion when booking on HomeAway. The views are stunning, the house is spacious and well suited for a large group. Also nice to be away from the city - quiet, very safe neighborhood. The breath taking views immediately put you in the right frame of mind. Thank you for the rental of your beautiful home. We had a family wedding in Nahant so it allowed us to have a lovely time enjoying our multi generation stories. Your house is great location for family reunions. We hope to get back soon. I have been going to the shore for 70 years. Never have I been to a rental/location with this much character and such beautiful views. Joe and Linda met us at the property and shared much useful information about the property and area... and more importantly, made us feel at home. Across the board to a person, everyone loved the experience but missed the A/C. Too much time sitting in front of a fan. Absolutely perfect place to stay - Truly spectacular!!! Rented the home for a girl's trip for my 50th birthday and the word of the trip was AMAZING! House is a perfect location and views were everything I expected and more. Very easy to get around and to grab Ubers throughout the 6 day vacation. Linda and Joe were wonderful - very nice, down-to-earth people. This was my first VRBO rental and it went through without incident. I texted Linda for recommendations, prior to my stay and she responded very quickly. Nice yard to play bocci ball and washers, short walk to the beach, and house was very comfortable. I would highly recommend staying at this beautiful home and would definitely come back! None of us (all 5) did not want to leave.....AMAZING TIME! Such a great property, beautiful views of sunrises and sunsets,. fishermen and lobster men, many boats and even cruise ships Our family had a wonderful time. House was clean and large enough for all 16 of us to enjoy a fantastic week! May and September-low season rates-spring and fall-weekends-range from 2350 to 2950. June,July,and August-High season rares- summer and holidays- weekends-range 2700-3500. Weekly-range-6500-7500 Events and functions ie.,wedding related, corp. meetings, during your stay carry an extra fee.